Perhaps the signature fly fishing experience of Northeast Florida, flood tides are our personal favorite opportunities to pursue the infamous "tailing redfish". Beginning in mid summer and lasting until late fall, flood tides offer fly anglers of all skill levels an unforgettable experience. We'll take you to the best spots deep in the marsh to get you every shot possible at catching these magnificent fish. It doesn't get much more exciting than casting at a fish coming down the edge of the creek, its back out of the water, making a huge wake as it heads towards your fly. Low tide fishing can challenge even the most expert fly anglers, but the rewards are great. Northeast Florida's low tide fishery lasts year round, but peaks in late fall to early winter. 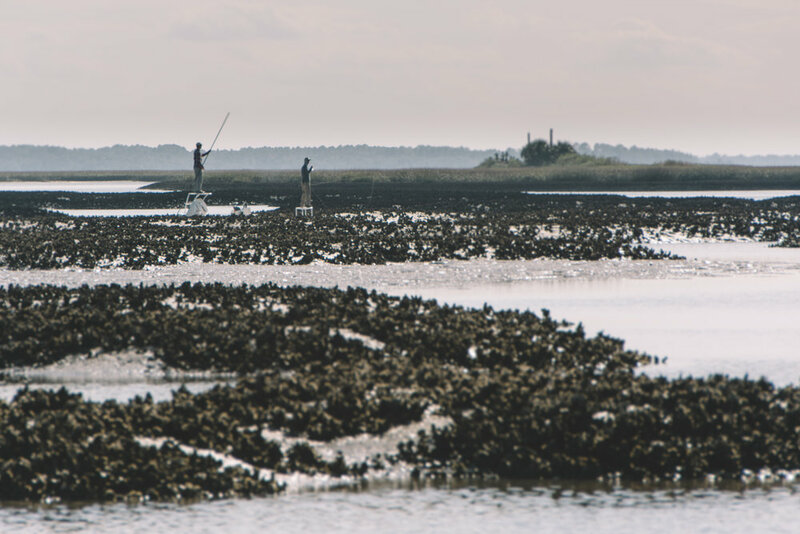 Let us pole you around some of the region's best creeks and tidal flats in pursuit of skinny water redfish. As the water temperature warms in late spring, many migratory and pelagic fish travel to Northeast Florida's beaches. Tarpon, jack crevalle, blacktip shark, tripletail, bonita, and cobia are just some of the species that make their way to our coastal waters. If big water and big fish are on your fly fishing bucket list, our guides have the knowledge and equipment to put you on the fish.